There are four tools to help you test your Engage implementation and campaigns. The Engagement Browser shows engagement hits received in the last 2 hours up to a maximum of 100. The results displayed by this tool can be filtered by userID, transactionID, Engagement Campaign or Decision Point. 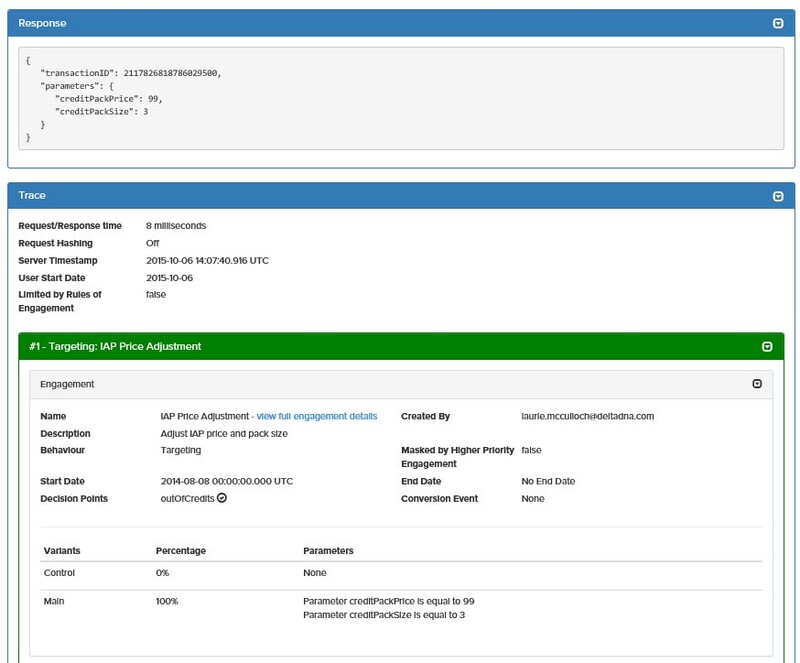 You can inspect engage requests and see the parameters sent with them and see if an engagement was triggered. 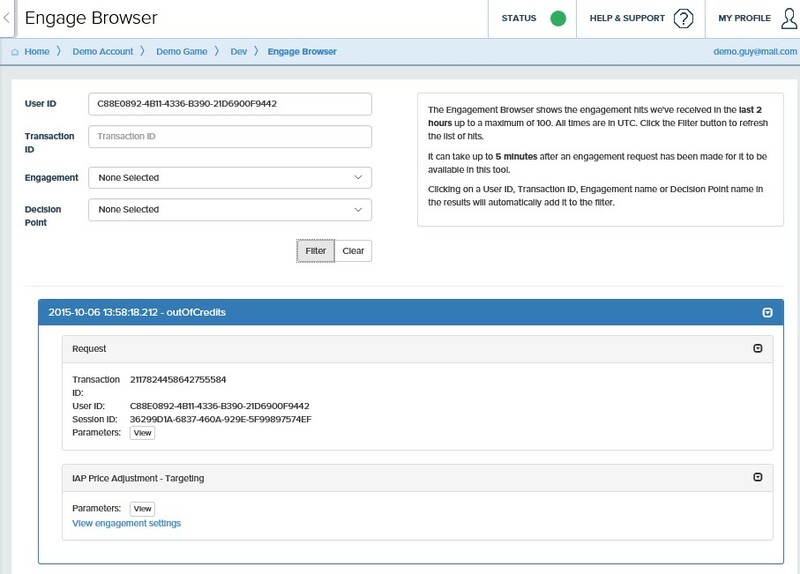 If an engagement was triggered you will be able to see which campaign it was and any response parameters. It can take up to 5 minutes after an engagement request has been made for it to be available in this tool. Click the Filter button to refresh the list of hits. 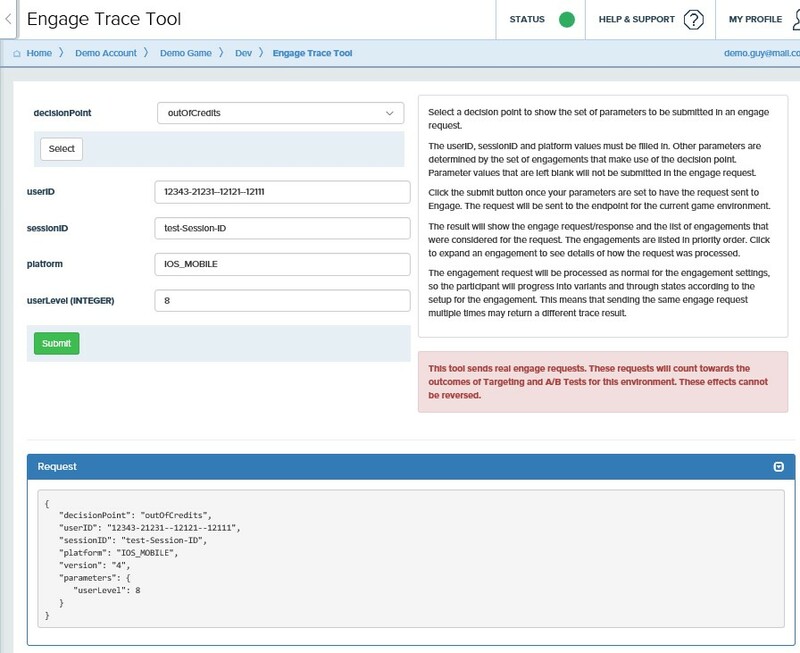 The Engage Trace Tool provides a mechanism for creating an engage request from within the deltaDNA platform, submitting it to Engage and inspecting the response along with more detailed output that will help you understand the logic that led to the specific response. Please Note : This tool creates real engagements that will appear in your data. The response not only shows the Engage output, but detailed traces showing each campaign considered in the decision making process. 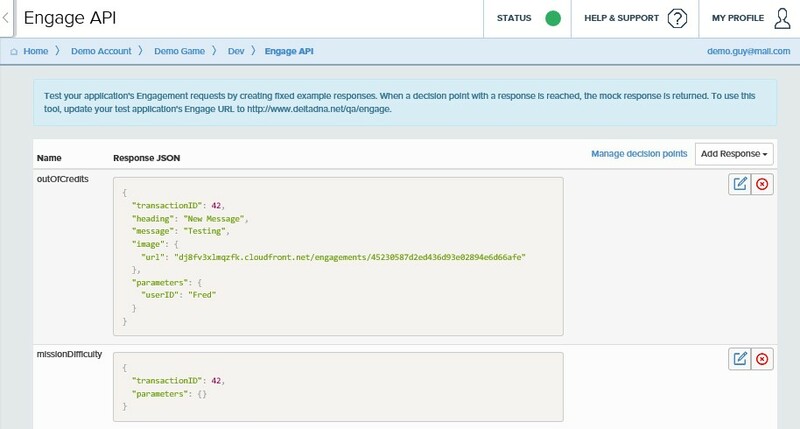 The Engage API tool provides an alternative Engage API endpoint that will always respond with the same pre-defined actions without needing to obey to any campaign rules. This makes it much easier to test that your game is instrumented to react to Engage actions correctly. The interface lets you assign game parameter, simple message and image action outputs to each decision point. It will show you the resulting output for each decision point. If you then make a request to the Engage QA API (http://www.deltadna.net/qa/engage/<Your Environment Key>) you will get a known response back for each decision point.